1 The Little Red Hen needed to feed her twelve little chicks. They were always hungry! Food was a scarcity. It seemed there was never enough food to go around. 2 She saved six of her precious eggs and decided to take them to town to try to trade them for some food for the chicks. She put her six large brown eggs into a basket and headed toward town. 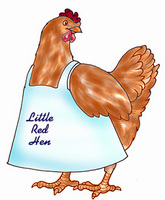 3 As the Little Red Hen walked, she looked at the ground ahead of her, always searching for something to eat. She ate some grains of rice that had fallen from someone's shopping basket. She swallowed a nice large grasshopper. She began to feel a little better. She hoped she could get some food for her chicks and they would feel better, too. 4 Soon she met Mrs. Brown, the farmer's wife. "Hello, Mrs. Brown," she clucked. "How are you today?" 5 "I'm fine," replied Mrs. Brown with a sigh. "But I walked all the way to town hoping to buy some eggs to make a cake, and the grocer was completely out of eggs." 6 "Perhaps I can help you," replied the Little Red Hen. "I have six eggs to trade for some food for my chicks. Do you have anything you could trade?" 7 "Well, yes, I do!" said Mrs. Brown, happily. "I have a large basket of wheat. I was going to take it to Mr. Jonas at the mill and have it ground into flour. But I have plenty of flour at home. Would you please trade your eggs for a basket of wheat?" 8 The Little Red Hen and Mrs. Brown traded something of value to each other without using money. This is called barter. The Little Red Hen gave Mrs. Brown her basket of eggs, and Mrs. Brown gave the Little Red Hen her basket of wheat. They said goodbye and went their separate ways. 9 The Little Red Hen was thinking about how happy her chicks would be to get this food. But it was just enough for one good meal for all the chicks, and then it would all be gone. The Little Red Hen began to think of other ways to use this wheat instead of just eating the grains.